The Chief Arbiter declared "Today is the 'lucky' day for men, because you will have 3 games". In today's last round, GM Vugar Gashimov from Azerbaijan defeated the sole leader Chinese Wang Hao in a complicated fight.The game that Wang Hao played was too aggressive, and Gashimov then showed a very accurate defence and counterplay. The American GM, Gata Kamsky gained today's second victory. He defeated Shahriyar Mammadyarov from Azerbaijan. GM Ruslan Ponomariov also won over GM Maxime Vachier-Lagrave from France. Peter Heine Nielsen scored his first win in this tournament against the legendary GM Vassily Ivanchuk, who does not appear to be in good form, and lost all 3 games today. The Chinese player, Wang Yue also gained his frist victory, when he defeated Le Quang Liem from Vitnam. The other games all ended in a draw. After 5 rounds, Wang Hao is still the sole leader however and tomorrow's games will be decisive for the award of the first medals and prizes. 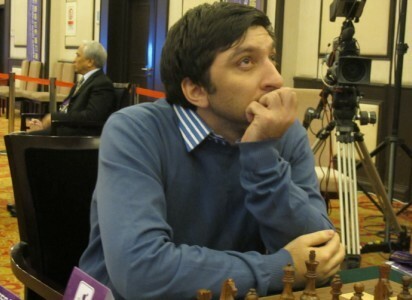 Vugar Gashimov and Ruslan Ponomariov are trailing just 0.5 point behind and of course, anything can happen. Tomorrow we will see who's the Rapid champion!